There are more keys on one piano than Sumatran rhinos left in the world. That includes all 80 Sumatran rhinos -- in the wild and in captivity. Adding to the concern of scientists trying to save them, these rhinos "would rather fight each other than mate." The UK's Evening Standard notes that the only way to get the species to reproduce might be through cloning. Of the Sumatran rhinos left in the world, those that live in zoos "tend to attack each other rather than pair," while those that live in the wild have distance issues: "males are so widely dispersed in the wild that they cannot find females when it comes to mating season." Meanwhile, just two Sumatran females in captivity have reproduced in the last 15 years. * They are the smallest of the living rhinoceroses (source: Evening Standard). 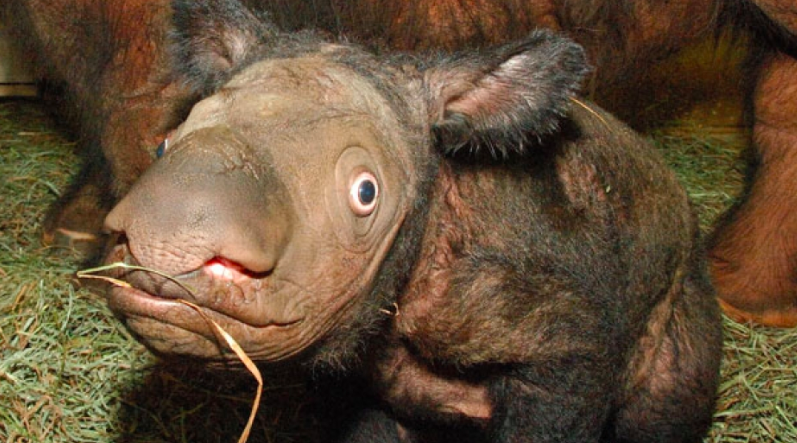 * They are also the only Asian rhino with two horns (source: World Wildlife Federation). * They are the oldest rhinos on Earth (source: Public Radio International).